Devils on Horseback, a variation on the popular Victorian savoury Angels on Horseback, was itself a variation on the paradoxically named French dish Huitres à la Diable. 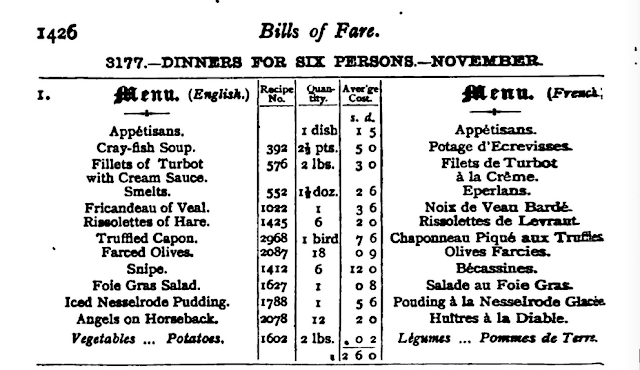 The savoury course was the last dish served in a formal 19th century dinner and made use of ingredients such as grilled cheese, bacon or salt fish. These were considered as an excellent choice to 'seal' the stomach at the end of the meal. The number of courses in present day British dinner parties may have dwindled to four but most guests would still expect to end the meal with cheese and biscuits. As someone who has cooked, hosted and eaten an eight course Victorian dinner, I can attest that they do work, as long as you have convivial company, a lengthy period for dining and you don't consume too much of any course! As we live on one of France's major oyster producing coasts, I am hoping to include the older version as well in this recipe challenge but in the meantime let's make Devils on Horseback. Anything with the word devil, devilled or the phrase à la diable in cookery actually just means split, put on a spit or stick and grilled. In my copy of Larousse Gastronomique, Huitres à la Diable is indeed rather boringly translated as 'Grilled Oysters'. 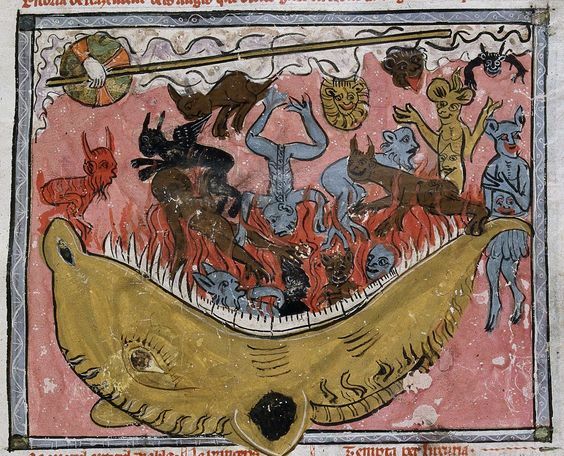 This is somewhat redolent of the Mediaeval Church's parclose screens and doom paintings, where Hell was portrayed as demons cooking on a gridiron. Left the Fallen Angels from Le Breviari d'Amor by the Franciscan Friar and Poet Matfre Ermengaud. The more interestingly tangy side of the dish was sauce à la diable which accompanied the grilled meat, the main ingredients of which were, tomato, vinegar, shallots, Worcester sauce and cayenne pepper. Chevalet is a term now meaning support or easel, in the original meaning it was a three legged stool upon which a farrier rested the horse's foot whilst trimming the hoof, think also 'sawhorse' in English. In culinary terms, as with canapé (French for sofa), it referred to a savoury which sat on or was supported by a small piece of toast, pastry or similar. En chevalet also referenced the trimming of the bread and its additional covering with a wafer thin slice of ham or fat bacon to support the grilled meat and keep it in shape. Both the bacon-wrapped prunes and oysters are sometimes served on a bed of toast but the 'Angels' are more often presented in the half-shell. Above is a suggested dinner menu from Mrs Beeton's 'entirely new', revised and expanded edition of her Book of Household Management, published in 1880. This is the first time the recipe appeared. It is not in my very scruffy edition of 1861! My favourite cookbooks are those written prior to the turn of the last century. They actually make very good reads as the writers are commentators on society, social history and contribute interesting anecdotes on the raising and growing of the foodstuffs. Preheat the oven to 400°F or 200°C. Cook for approximately 10 minutes. Soak the prunes in water. I just brought some water to the boil took it off the heat and then popped them in, they plumped up within a few minutes and then I removed the stones. Soak the wooden picks in water. This is to prevent them from charring in the oven. Take each slice of ham and using the back of a knife, run it along each piece in order to stretch it. This prevents it shrinking when cooked. Wrap each prune in a slice of ham and fasten it with a pre-soaked cocktail stick. Place on a buttered tray and place in oven for 10 minutes or until ham/bacon is crisp. Serve hot - but the are good cold too!